Phuket has emerged as one of the most enthralling tourist destinations in the world. Every year over a million holidaymakers from the UK book cheap flights to Phuket. Picture perfect beaches, top rated family attractions, thrilling recreational activities, great value spas and never ending shopping outlets all make Phuket an incredible holiday hotspot for Phuket flights. Typical Thai beach life can be experienced at Patong Beach. This is one of the most popular beaches in the city and Globehunters can offer our customers prime Phuket accommodation hotspots dotted along this famous strip. Travellers can now take advantage of the cheap flight deals to Phuket due to its popular demand. Simply call Globehunters today or book online to this sought after holiday destination and save on your next flight to Phuket. Apart from Patong Beach, other beaches that create a surge in people to find cheap holidays to Phuket are Karon Beach, Kata Beach, Paradise Beach, Mai Khao and Nai Yang Beach. The variety of beaches in the region leaves holidaymakers spoilt for choose as to where to soak up the Thailand sunshine or where to sip a delicious Thai cocktail or take a relaxing massage. Phuket is also suitable for families with children young and old, with plenty of activities to keep them entertained, not to mention the snorkeling, swimming, diving, sailing, delicious sea food and vibrant nightlife. Kids can enjoy the Splash Jungle Water Park where they can have fun in refreshing pools and feel the thrill of the numerous high rise slides. Other popular kids attractions in the city are Phuket FantaSea Show and Phuket Aquarium. If you are looking for Phuket flights to take advantage of the cheap and value for money shopping then you can’t go wrong visiting Index Living Mall, Phuket HomePro Village and Ocean Plaza Bangla Patong. For nature lovers, Phuket is nothing less than a paradise. Koh Tarutao National Marine Park, Sirinat National Park and Khao Phra Taew Wildlife Sanctuary are the most popular natural attractions in the area. You can browse through plenty of cheap flights to Phuket for your next holiday. 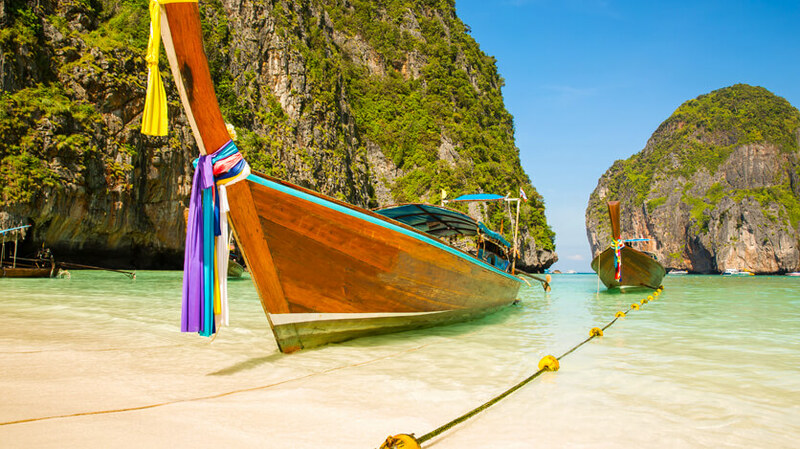 To book your preferred flight departure dates and airport to Phuket, call us and speak to one our specialist Asia travel consultants or simply book online with our secure online payment sevrice. When booking flights to Phuket at Globehunters, you don’t need to worry about the financial security as we are the members of ATOL (Air Tour Operators Licence) and IATA so your money is 100% financially protected.